Showcase you a solo cupcake in this box set. Our CBS56 box set is perfect for a standard size cupcake or muffin. 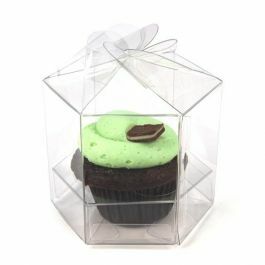 The set includes a 4" x 4" x 4" crystal clear box and an insert to securely hold your cupcake. Boxes help reduce airflow so your cupcakes stay fresh for longer periods. Clear stickers are included for a tamper-proof closure. Food safe. 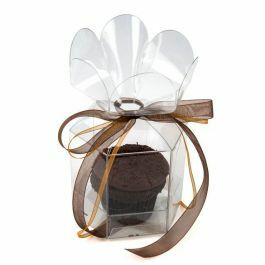 Create a beautiful display for single standard cupcakes with this packaging box set. CBS56 includes a 4"x 4" x 4" crystal clear box and plastic insert. All materials are food safe and offer a high clarity presentation for your frosted creations from top to bottom. The 12 mil box is made of high-density PET material for durability. 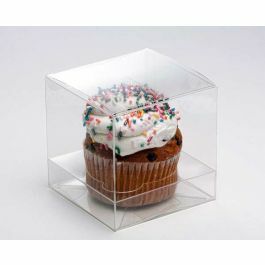 The clear insert offers a flat, even base for your cupcake display. Boxes are stronger than bags and help to reduce airflow so your cupcakes stay fresh. Add a ribbon or label to complete your presentation. To further enhance your brand, print directly onto this box with a customized design. Custom printing is available. Box sets include clear stickers for a tamper-resistant closure. Outer Dimensions: 4" x 4" x 4"
The primary use for CBS56 is for holding a single standard cupcake or muffin.